And a little development post about our late friend, up for Patrons now. I’ve been thinking about my goals for the rest of the year, since I got a lot of the hard/ time-consuming stuff out of the way Jan-April, which gives me Summer/ Fall/ Winter to think about. I’ve decided I am going to try and finish MI in 2017, which means prioritizing updates as much as possible, so, we might see increased updating here. I have finished chapters before, but never a full work, and I think it would probably read better from this point forward if I update more frequently. We’ll see how this goes for now! Also: the good folks at Beyond Press just launched their Beyond Anthology 2: Urban Fantasy and Post Apocalypse title! An amazing collection of comic stories, definitely give it a look. And best of luck on completing this comic!!! :D That’s so inspiring! I think I’d like to take a page from your book and complete the novel I started by the end of this year as well! Motivation FTW! :D I also cannot wait to see how this story turns out once it’s all done!!! :D I wonder how Michael’s doing…. Michael’s Fine. at least he was before you killed a friend he made in this cavern system. sure he has a few more bits and pieces than he did, but its to help him survive this underground system. at least that’s the effect of it. if you just calmed down, and not freaked out so much, you would probably see the interesting things about this underground habitat. Ah yes, that’s what I say to myself every time I’m trapped in a hellscape from outer space, populated by incomprehensible creatures that all seem to crave my limbs and liquids. Just getting overexcited again, that’s me. Why don’t we all bond over this rock. Why don’t we literally bond. There we are, whole conflict solved. Wow, even worm ants seem to fear the processor, it must be tyrannical (that or it’s itimidated by Bex). Well, they said ‘forbidden’. If this really is a system with a processor (in the information-processing sense), then direct access by low-level processes *must* be forbidden as a basic security precaution. Doesn’t necessarily mean the processor is a tyrant, merely that the system is well-designed. Aww it’s kind of adorable how spiderworm curls their proboscis in discomfort while getting what I’m right now dubbing “The Bexxing”. I think it’s indicating that LEVi knows where a processor is and how to get to it, rather than LEVi IS a processor. It is very interesting that “Registry recently updated” “data synched” happened, and then the whole system could suddenly speak English! It’s an assimilating and learning biological “computer”, so it makes a lot of sense, and it’s an awesome concept! Loved it! So… she got away from the ocean monsters because they altered her to understand them AND because Mike recognised her and went into the ocean which updated their knowledge of her? According to her, a bunch of different monsters have been attacking her regularly (the the point of being literally able to set a watch by them), but now instead of attacking they are having conversations and it’s very confusing. Mike apparently brought her as his +1 and everyone has only recently got the memo. The fact she could set a timer/countdown to the attacks is interesting… Like a scheduled job or process. I wonder why it couldn’t/wouldn’t attack randomly or consistently. Sadly. I just realised that if Kalla is revived then she won’t remember anything after rescuing Mike. None of their reconciliation on the beach and buddy talk up the slope. Also makes me wonder why Mike was attacked by those paralyzing creatures… His hostility towards Kalla and/or intent to find a processor? It timed quite nicely with his return to the blue ocean where his intentions may have been read (Or Kalla’s return to the blue). Yes!! More Mare Internum updates!! 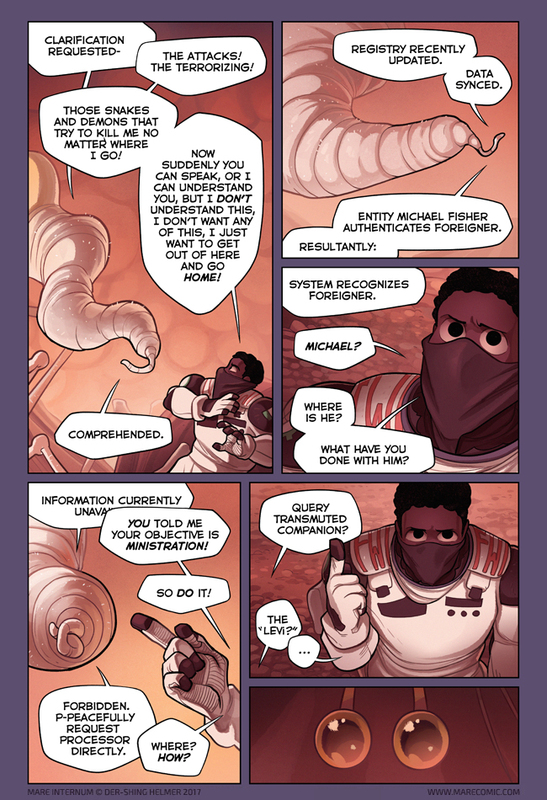 The worm monsters should be careful! A friend of mine totally borked his operating system while updating his registry! Careful how much you point fingers there Bex :O After all you’re the one who wants to hang on to all your digits, and there’s no telling how good your new acquaintance’s short-term memory is. Though to their credit, they seem awfully polite, minus that whole limb regeneration misunderstanding. I just love the idea of the sea as a neural network connecting and maintaining this whole ecosystem. Also I love the set-up of this page, with that last panel of little Threvi's eyes. The "timing" of it just feels right, a little comic and a little "o-OOOHHHH?" I, for one, welcome our new worm boi overlords prioritising MI over TM for the home stretch. Wait! Does “Data Synced” mean Michael finally killed himself and has been resurrected… like just now? Not sure about the snakes (unless they are the hammerheads we saw in the first cave Mike got into), but I guess Kallakore could count as a demon, which explains why Bex would attack her unprovoked.